Now that we've decided we cannot let these hunks of metal leave our hands, we're ready to personalize them for the boys. My wife and I are torn and are 50/50 on whether we should have their names on the plates or something similar to what we currently have on the 77. I wouldn't do the mom. the other kids will taunt them and call them mom's boys. Nothing wrong with being a mommas boy but kids will be kids. I like their names and they will also. remember as a kid finding stuff with your name. Like those little licence plates for you bike they were cool. My $0.02($0.00002) in today's dollars, adjusted for inflation and the CPI. Vanity plates only make sense to the people that have them put on the vehicle. Very good points Randy! Thanks......kids can be cruel for sure....while it would be hard to make fun of a kid riding around in rigs like these, like you said, kids will attempt to taunt for whatever reason. Thanks Doug.....did they have a monetary system back in your day? Was it the denarius? But I would agree with you that people have personalized plates that make sense to them.......it's always been my pet peeve that people would have plates that aren't generally able to be understood.....almost makes them a wasted effort unless it was purely for themselves and their families. 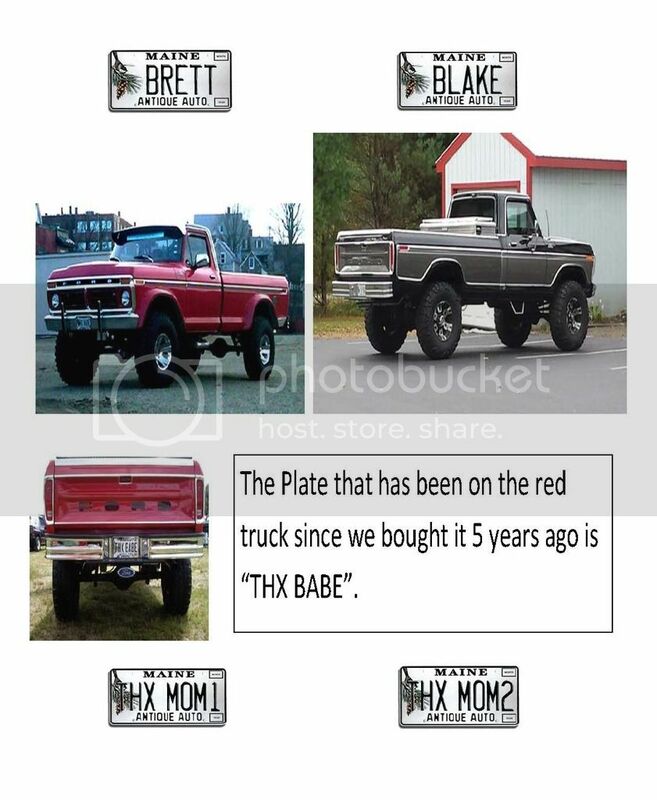 Over the years the "THX BABE" has gotten some great remarks as it can either say, "Thanks for letting me buy it." or "Thanks for buying it for me." and we've never told anyone definitively which one it was meant to say. Actually, it was the drachma. I've always prefered to blend in with the crowd and be less easy to recognize, therefore I go with the state ones. On the other hand.......if I had an older vehicle I'd consider a period correct/year of issue correct plate and tag for that vehicle. Depending on the year and especially the condition, those can bring some good coin to an ebay seller.